The Washington Post runs another hard-hitting piece on the famine plaguing one of the poorest nations on earth: Malawi. Dawn's Early Light is especially concerned about Malawi [See DEL IR: Malawi] especially since Tod Bolsigner's church, San Clemente Presbyterian, has made a 10-year commitment along with other churches and World Vision to transforming the Nkhoma region of the country. "An estimated 5 million of Malawi's 12 million people are hungry this year, according to the United Nations. Hospitals also report higher rates of malnutrition and, with the harvest still five months away, unusually large numbers of hungry children are beginning to sicken and die in rural areas." "Malawian agriculture once appeared to have a brighter future. A state-run farm agency, although widely criticized as overbearing, sold reliable supplies of seeds and fertilizer and guaranteed prices for whatever was grown. And for a time, the government actively sought ways to build irrigation networks drawing on the mighty Shire River that flows through the dry, destitute valley south of Blantyre, Malawi's commercial center. But in the past 20 years, under pressure from the World Bank and donor nations, Malawi has liberalized its agricultural economy and dismantled the state-run agricultural system. The government's clumsy implementation of this change has led to complaints from farmers such as Bingolosi about the market's failure to deliver a more efficient and bountiful harvest. The government has also sold off state food reserves at times, leaving nothing for emergencies. Meanwhile, various water schemes have remained on the drawing board. Today less than 1 percent of this southern African nation, roughly the size of Pennsylvania, is irrigated, and that land mainly belongs to commercial farms that grow tea, sugar and tobacco for export." Total World Bank spending for Malawi totals $2.4 billion when completed projects are included beyond the 13 active development projects currently operating. This amounts to approximately $200 per person, or 1/3rd of the annual per capita GDP. The World Bank also made available $30 million in relief funds on September 15, 2005 due to the famine. The famine is devastating as 90% of the 4 plus million labor force is employed in agriculture. The current President of Malawi, Bingu wa Mutharika, is no stranger to controversy and charges of corruption. Corruption seems to be one of the major reasons for the failure of Malawi. The Corruption Perception Index (CPI - based on 10 being non-corrupt to 1 being totally corrupt) scores Malawi with 2.8 in its most recent 2005 summary as compared to 4.1 as recently as 2000. While reform is needed in Malawi, the famine today is real, regardless of the politics on the ground. Give a specific amount from $20 to $2,000 for direct food aid here. Send a child to school in Africa for a year for only $75 here. Help Africans purchase seeds, tools and receive training by donating here. 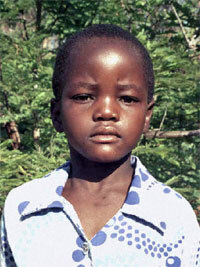 Sponsor one of God's children here and select "Malawi". Spotlight on Malawi - Where? Where is Malawi you ask? Find out here for a little refresher. Malawi, towards the southern tip of Africa, is not a nation on the international radar or consciousness. However, the Washington Post gave it "above the fold" attention on their webpage today regarding a massive famine. "A drought across six southern African countries has left 12 million people hungry this year, according to the United Nations. None has reached the acute hunger crisis faced by Niger, in West Africa, during the summer. But Malawi has long been ravaged by malnutrition, AIDS and desperate poverty, and many children are now suffering from all three afflictions." "One by one, the women of this hungry village untied their babies from their backs and hung them on a scale dangling from the limb of a mango tree. As a volunteer called out the weights, Anna Bande, a nurse, grimly plotted the toll of southern Africa's latest drought on Malawi's young. 'It is affecting every child,' Bande, 53, said wearily as she drew lines on grubby paper growth charts last Thursday. Instead of the smooth upward arc of healthy, growing children, the babies of Mbadzo had lines that zigzagged slowly higher before spiking down in the past month, as the last of the food from a disastrous harvest disappeared." Many children, both who have parents and the many orphaned children from the scourge of AIDS, are suffering from malaria, jaundice, malnutrition and other diseases. Many children and adults are likely to die because of the lack of food in the country badly affected by drought. What can you do? If you have a little over a dollar a day, you can sponsor a child from World Vision. Click here and select a child from Malawi and make a difference today. Sponsor two children. But make a difference today. So maybe you don't want a long-term commitment, how about a one-time gift? "Mary lives with her parents, 3 brothers, and 1 sister. Her parents struggle to provide for the family. Mary and her family live in a community severely affected by the HIV/AIDS crisis. In some communities, AIDS affects the entire social structure as a generation of hardworking adults is being wiped out. Frightened children and exhausted grandparents rarely have money for food, school, or medical care. Through sponsorship, you can ensure access to these and other basic needs for Mary and her family. Mary is in primary school and she enjoys studying the national language. She helps at home by caring for the animals. She likes to play group games. She is in good health. Your sponsorship commitment will help provide Mary and her community with the assistance they need to save a generation from the HIV/AIDS crisis. World Vision will faithfully use your sponsorship support of Mary to meet her needs and minimize the impact of AIDS in her community through tangible prevention and care programs. You are an answer to prayer, helping children and families gain access to basic needs and learn about God's unconditional love." It is a former British colony that won independence on July 6, 1964 from Great Britain. Why is Dawn's Early Light featuring it? Good question. San Clemente Presbyterian Church Pastor Tod Bolsinger (and It Takes a Church blogger) is leading a team of 7 church members, one a doctor and another a nurse, on an advance team mission to Malawi for two weeks. They are a part of a 10-church partnership in coordination with World Vision that is looking to lay the ground work for a 15-year partnership to effect change in one of the world's poorest countries. Tod's posts on Malawi can be found here. Because I am interested in the success of this mission as this team lays important groundwork to improve the living conditions in the Nkhoma region, Dawn's Early Light will make it a regular feature. Posts can be found here (or by clicking IR: Malawi under "Categories" on the side menu) that will draw attention to a country that is easy to overlook in the West. The country, after winning independence from the United Kingdom (it remains a part of the Commonwealth) ended up with one-party rule. The first free and fair elections were just over 10 years ago in May 1994, which were won by the United Democratic Front (UDF). A subsequent free and fair election was held in 1999, where Bingu wa Mutharika won the presidency. However, due to an anti-corruption campaign, he and his party ended their relationship in February of this year. "Wa Mutharika is a Roman Catholic while his predecessor and UDF leader Bakili Muluzi hails from the southern African country's growing Muslim minority. But the hostility between the two is political rather than religious and the staging of the protest on Good Friday was prompted more by the fact that wa Mutharika was making a rare public appearance. Elected last May as Muluzi's hand-picked successor, wa Mutharika has fallen out with his erstwhile champion and party after pursuing an anti-corruption drive that has targeted many of Muluzi's close allies within the UDF. The power struggle came to a head in January, when wa Mutharika accused Muluzi of backing a plot to kill him and dramatically quit the UDF to go it alone, appearing to trump Muluzi's efforts to have him expelled from the party. The UDF and the main opposition party threatened last week to team up to impeach wa Mutharika over accusations that he has violated the constitution 10 times since his election. The Public Affairs Committee, Malawi's most influential religious body grouping Christians and Muslims, called on parliament on Friday not to impeach wa Mutharika, but to punish him in some other way for any violations of the Constitution." "The Malawi Government is admitting that a serious food crisis has hit the country. The crisis may be similar to the nation's worst famine which killed hundreds of people three years ago. '…Most of the crops, more especially maize, are not in a condition to give farmers bumper yields,' said Malawi's Agriculture, Food Security and Irrigation Minister Gwanda Chakuamba. 'In short, this is another year of starvation.'" An honest admission. Prior to this post, I would have struggled to put Malawi on a map (not surprising for an American?). Hopefully you have found this post on Malawi as educational and depressing as I have. Hopefully, it will inspire us all to action.